Head-On vs Solo Build It! Solo Build It! 's integrated combination of process, tools, guidance, auto-updating & 24/7 help has enabled more solopreneurs to build profitable businesses than any other product. We know that's a bold claim. We know, too, that any company can say that they're the best. However, we're the only ones who prove it in easy-to-verify ways. The others would if they could. No company has ever tried to claim our title as "the best" (not even when we issued a $50,000 Challenge). Recently, though, we noticed that one did! We got to the bottom of the Wealthy Affiliate claim fast. "Fake (Review) It 'Til Folks Buy It!" We first became interested in Wealthy Affiliate after discovering scores of reviews about Solo Build It!. If that sounds odd, it gets odder. Some pretend to be objective. Many even use the same comparison chart. 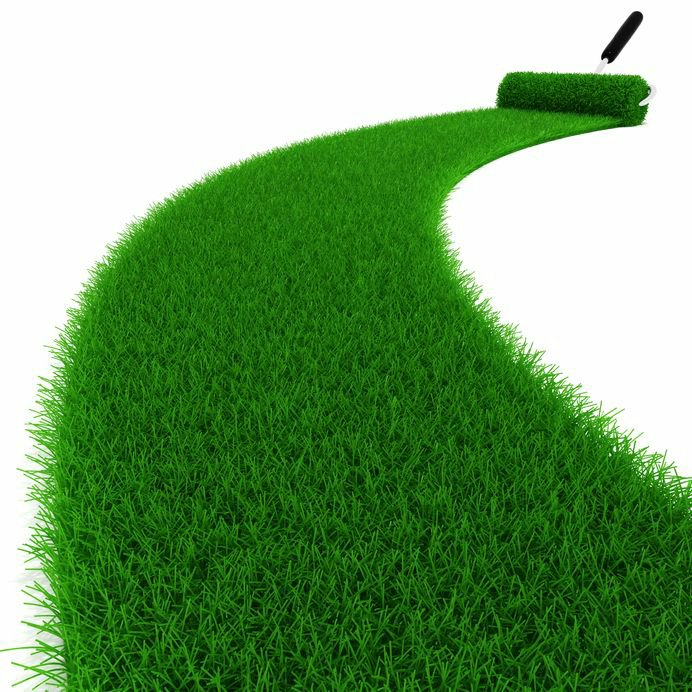 Astroturfing (aka "Astroturf Marketing"): includes "the practice of creating fake reviews that may be extremely deceptive to consumers." "Those who engage in astroturfing typically use specific types of digital media, like online review sites." "The use of astroturfing in digital venues is actually being pursued by state law-enforcement offices in New York and elsewhere in the United States. Officials are reviewing the practice of creating fake reviews..."
The review was just the bait! They trick those who are interested in SBI! into believing they have found a review about it. Then they pitch WA by linking them to their Wealthy Affiliate review. It soon became clear that this was not just a couple of rogue affiliates. Hundreds of reviews were virtually blanketing search results for review(s) of "Solo Build It!" or "SBI!" (or even our older name, "Site Build It!"). As a result, we did a deep-dive into WA's affiliate training techniques, which focuses almost totally on writing reviews. It even provides a list of 175 products to write about. The "bait-and-switch / fake review" is a growing affiliate marketing tactic. It also happens to be illegal, a form of "misleading online advertising." It reflects a willingness to deceive the solopreneur. You can do something about it. Gain the honesty you deserve and help future solopreneurs — report this immoral and illegal practice. Let's put aside the morality and legality of fake reviews for now, and get to the study. Neither Wealthy Affiliate nor its affiliates provide any verifiable evidence of success. We always have, loads of it. This study focuses on Wealthy Affiliate because of the claim that it's better than Solo Build It!. More importantly, we suspected that WA was leading solopreneurs to failure, not success. Whom should you trust your future with? Which product delivers success and which delivers failure? Only a head-to-head study could answer these questions clearly. Take every active SBI! and Wealthy Affiliate site. Measure their traffic using 3 traffic tools. Tabulate and show the results. If you're the type who likes every last detail, here's the full study, including a detailed "how-to" (in Part 2), so that you can perform the study yourself. Part 2: Debunk vs De-bait, Methodology, Why Traffic? This 3-part series exposes an elaborate and long-standing scheme that seems to have led thousands (perhaps tens of thousands since 2005) to dashed dreams. Which Is Best for Solopreneurs? 1) SBI! 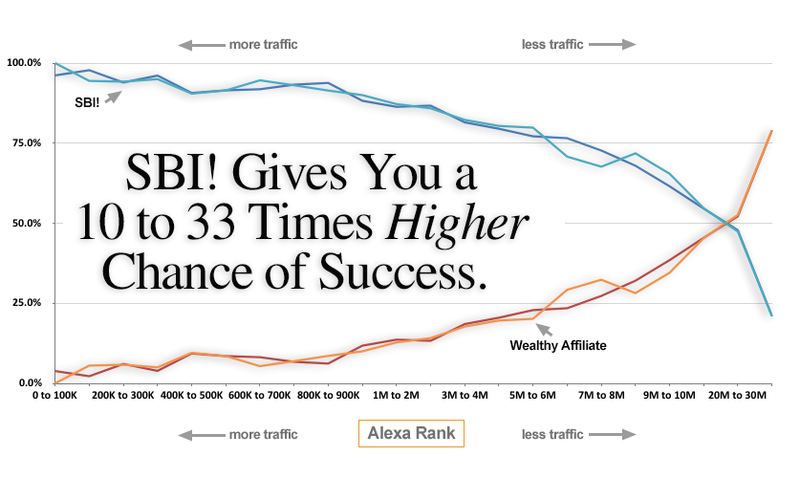 sites are 33 times (33X) more likely to achieve "Outstanding - Excellent" levels of traffic than Wealthy Affiliate sites. 2) SBI! sites are 10 times (10X) more likely to achieve "Medium" levels of traffic than Wealthy Affiliate sites. 3) 87% of Wealthy Affiliate sites are "Invisible." This is the only category where Wealthy Affiliate "beats" SBI! (i.e., in the worst level of failure — "Invisible" — they get no detectable traffic). Needless to say, affiliates who recommend WA are not doing you any favors. Please read on for the summarized description, results, and analysis of The Study. Call us toll free — 1-888-987-3669. The Study: What If the Truth Came Out? The goal of The Study is very simple: determine which product is more likely to enable solopreneurs to build profitable online businesses. We're only looking for big picture, absolutely conclusive/meaningful differences. Does one product make a solopreneur significantly more likely to succeed than the other? No vague claims, no Photoshoppable scans of commission checks, no testimonials from people who don't even include their domain name. Just a well-built, objective, rigorous, statistically significant and reproducible study. We must define success before we can measure it. To truly document success, we need hard data that can be verified by anyone. The best way to document success is by determining organically grown (i.e., free) site traffic. Anyone can buy traffic, but there's a steep learning curve and it requires the solopreneur to sell a product with a high enough margin to justify the expense. The same amount of traffic can generate different amounts of income, depending on how you monetize. And that's fine, because whatever someone's monetization mix may be, it's fair to say that income is proportional to traffic. And no traffic = no income. Traffic can be easily determined and verified. Income statements from 27,000 sites can't. So traffic is our best proxy for success. The Study will, therefore, measure free, organically grown traffic as its indication of success. In order to compare apples to apples, The Study must use the identical methodology to analyze SBI! and WA traffic performance of active ("real") sites hosted at Solo Build It! and Wealthy Affiliate. To ensure accuracy, we used 3 different industry standard analytics tools for measuring website traffic — Alexa, SimilarWeb, and SEMrush. Note: Many people have an out-of-date impression about Alexa — see this series of articles for up-to-date information. If we exclude Alexa, SBI! 's advantage grows even greater. Using all 3 measuring tools provides greatest accuracy, though. 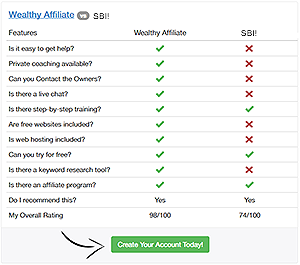 1) Get the list of websites for Wealthy Affiliate and SBI! from whois.domaintools.com (or any source that provides all sites hosted under each name server). 32,582 domain names were listed under "MYWAHOSTING.COM" (WA's nameservers are NS1MYWAHOSTING.COM and NS2.MYWAHOSTING.COM). 16,973 domain names were found under "SITESELL.COM" (SBI! 's nameservers are NS1.SITESELL.COM and NS2.SITESELL.COM). 2) Reduce the sites to a list of "real" sites. The Study defines a "real" site as one that has a home page and at least one link to a second page on the same domain name. 15,768 WA domain names were not real sites at WA. 7,025 SBI! domain names were not real sites at SBI!. Note: If we had kept all domain names in the study, SBI! results would have been even better when compared to WA. More than twice as many of these "non-sites" belonged to WA. 4) Finally, we organized the data for usable presentation. SBI! gives you a 33X higher chance of high-traffic success. Wealthy Affiliate cuts your chances by more than 90%. Outstanding-Excellent — The sites in this range are in the Top 1,000,000 sites (out of a total of 170,000,000 active sites). Medium — This is a broad range, good traffic to low traffic. Poor — This range is also broad, low traffic to invisible (no detectable traffic). Three tools were used to measure these sites' traffic: Alexa, SimilarWeb, SEMrush. Important: The 3 tools agreed with each other for all results. This, combined with the massive superiority of SBI! over Wealthy Affiliate, leads to an extraordinarily high level of confidence in these results. Outstanding-Excellent Traffic is defined as having Alexa and SimilarWeb rankings of less than 1 million, and an SEMrush traffic score of greater than 5,000. Results in shown in pairs for each traffic range (0-100K, 100-200K, etc.). SBI! sites are the blue bars, WA are red. 1) The difference of 697 to 53 in the Top 1M is striking, especially because SBI! has 7,000 fewer sites. 2) When corrected for the number of sites, SBI! is 22X more effective at helping solopreneurs build high-traffic sites. 3) Outstanding: Now look at the 0 to 100K range. This is the "Outstanding" part of the Alexa Top 1M "Outstanding-Excellent" range. It's virtually unachievable for solopreneurs, almost the exclusive territory of larger businesses. SBI! has 25 sites here, while WA has 1. 1) SBI'S 10,000 sites are a drop in the ocean of 170,000,000 active sites. 2) WA's 17,000 sites only place 1 site into each. Bar chart shows results in pairs for each traffic range (0-100K, 100-200K, etc.). SBI! sites are the blue bars, WA are red. 1) The difference of 647 to 34 in the Top 1M is striking, especially because SBI! has 7,000 fewer sites. 2) When corrected for the number of sites, SBI! is 33X more effective at helping solopreneurs build high-traffic sites. 3) Outstanding: Look at the 0 to 100K range. This is the "Outstanding" part of the SimilarWeb Top 1M "Outstanding-Excellent" range. It's virtually unachievable for solopreneurs, almost the exclusive territory of larger businesses. SBI! has 22 sites here, while WA has 0 (zero). To get a ratio for the Outstanding end, let's look at the 100K-200K, also extremely high traffic for a solopreneur. SBI! has 37 sites here, while Wealthy Affiliate has 1. The total sites in the 0-200K range are 59 to 1. Bar chart shows results in pairs for each traffic range (5-6K, 6-7K, etc.). Note: Right is better (sites have more traffic) than left. 1) The difference of 680 to 27 with traffic over 5,000 is striking, especially because SBI! has 7,000 fewer sites. 2) When corrected for the number of sites, SBI! is 43X more effective at helping solopreneurs build high-traffic sites. 3) Outstanding: Look at the 40,000+ range (the "Outstanding" part of SEMrush results). SBI! has 106 sites in that range, while WA has none. This huge difference further suggests that SBI! has an additional degree of search traffic superiority. Medium Traffic is defined as having an Alexa and SimilarWeb ranking range of between 1 and 10 million, and an SEMrush traffic range of 100-5,000. Although this division covers a wide range, we will see how Alexa, SW and SEMrush all show SBI! has the highest performance at the high end of "Medium," while WA only shows some significant contribution at the low end — although it still does not outperform SBI!. Bar chart shows results in pairs for each traffic range (1M-2M, 2M-3M, etc.). Note: The lower the number (left), the higher is the actual traffic. At 1-2M, SBI! 's ratio of sites in this "best of the medium range" is 7:1, decreasing to 6:1 at 2-3M until finally it's a bit less than 2:1 at 9-10M. Again, these numbers are uncorrected for the 70% differential in total sites. Corrected results are 70% more impressive! We see again a clear dominance of SBI!, averaging 6.4X (corrected) increased chance of reaching this level of traffic, across the entire division. Solopreneurs who use SBI! are the clear winners in this category. SW shows a similar ballpark of effectiveness for SBI!, increasing from 6.4X (Alexa) to 7.8X more effective. The dominance is similar, 86% increasing to 89% (corrected). And the pattern, as you move down in traffic from 1-2M to 9-10M, is the same. SimilarWeb corroborates SBI! 's dominance in Alexa of the Medium traffic range. SBI! accounts for 82% of the total sites in this range. SBI! accounts for 90% (3103/3463) of the total of SBI! and Wealthy Affiliate sites in this range. Correcting for the 70% difference, the percentage increases to 94%. Even more than the Outstanding-Excellent category, here SEMrush shows a higher ballpark of effectiveness, increasing from 6.4X (Alexa) and 7.8X (SW) to being 14.7X more effective. SEMrush corroborates Alexa and SW findings, an additional indication that SBI! has an extra degree of search-effectiveness. This final grouping is the most interesting and extremely important. Solopreneurs who manage to reach the Medium (or higher) levels of performance should know enough that, with continued application and improvement, they can work their way up the traffic ladder. However, failure to get out of the weakest category of the Poor-to-Invisible division indicates a lack of sufficient ability to succeed. "Ability" is merely applied knowledge. This category should be transitional for solopreneurs. Unless a site is here because it's just starting out, this is the "fail zone." And, perhaps not coincidentally, based on all that we know of Wealthy Affiliate by now, this is where it overtakes and far exceeds SBI!. Bar chart shows results in pairs for each traffic range (10M-20M, 20M-30M, >30M). In the two previous categories, we saw SBI! dominating high-traffic (22X) and medium-traffic (6.4X) when using Alexa. Wealthy affiliate suddenly "owns" the poorest traffic range of >30M ("Invisible:" 13,902 vs. 3,694). Note: The lower the number (left), the higher is the actual traffic (e.g., 10M = the 10 millionth most traffic, while >30M = undetectable traffic). In the two previous categories, we saw SBI! dominating high-traffic (33X) and medium-traffic (7.8X) when using SimilarWeb. Wealthy affiliate suddenly "owns" the poorest traffic range of >30M ("Invisible:" 14,490 vs. 4,037). These results are corroborated by the Alexa numbers. Bar chart shows results in pairs for each traffic range (0, 1-50, 51-100). In the two previous categories, we saw SBI! dominating high-traffic (43X) and medium-traffic (14.7X) when using SEMrush. Wealthy affiliate suddenly "owns" the poorest traffic range of >30M ("Invisible:" 15,308 vs. 3,376). 87% of WA's sites (almost 9 out of 10) are "Invisible." Only 37% of SBI! sites are in this category. Wealthy Affiliate's claims, along with its affiliates' fake reviews, offer the beginning of a sales funnel. The study suggests that, instead of offering a fair review that leads you to SBI! 's bright prospects, you are being led into a Wealthy Affiliate sales funnel that most likely ends in failure. This study measured the traffic performance of every real site of Wealthy Affiliate and Solo Build It! using 3 traffic metrics tools (Alexa, SimilarWeb, SEMrush), all of which delivered the same results. SBI! 's high-traffic superiority rises to 38X from 33X for "Outstanding - Excellent" traffic. SBI! 's medium-traffic superiority rises to 11.2X from almost 10X for "Medium" traffic. 87% of Wealthy Affiliate sites are "Invisible," which increases to 89%. Wealthy Affiliate claims a high level of success on its sales site ("There are 1,000's of people succeeding every day within Wealthy Affiliate"). In its affiliate training materials they suggest repeatedly that the affiliate serves the reader of such reviews well because there's nothing as good as Wealthy Affiliate. However, WA offers no proof of success. SBI! always has. Now we know that they can't. We can't promise you that you'll be right for SBI! and vice-versa. That's why we have the 90-day, money-back guarantee. WA affiliates, as a result of Wealthy Affiliate training, attacked us with hundreds, if not thousands, of reviews that recommend WA over SBI!. Worse, they do it through fake reviews as a way to reach and mislead those who seek more info about SBI!. And finally, those who continue to do so, do it with the full knowledge that they likely lead you to failure. In response, we designed a rigorous and objective study. Let the chips fall where they may. Now they have to live with that. This study has greater value than merely proving how effective SBI! is and how ineffective Wealthy Affiliate is. It's the first step toward a more vigorous response. Based upon research about Wealthy Affiliate, we do not believe that they'll stop what we believe to be an unethical, even illegal, marketing practice. Complaints by other victims and at least one lawsuit (to suppress a negative review about them) convince us of their determination to stay on this course. Sadly, we expect the fake review problem to continue to grow. The promise of money (that only a small percent will ever earn) from this practice will keep pushing more fake reviews about SBI!. Do not be fooled by fake reviews about Solo Build It!. They push you away from purchasing SBI!, a product that gives you a far better chance to succeed. They do so to earn a huge commission. Look for real reviews by real users of SBI! (see some examples here). You'll recognize them by their domain names. They have little financial incentive to write about SBI! because their sites are about real niches (e.g., table tennis or the Victoria Falls). Those are the real McCoy. While high traffic is not an absolute guarantee of financial success, you can't earn much, or build equity in your business, without it. Use Alexa, SW and SEMrush to sniff out the baloney. Compare those to the massive difference between SBI! and Wealthy Affiliate. Note how the 2 pairs of lines intersect at 20M, the second-to-worst traffic level. And see how, after 20M, WA far surpasses SBI! at increasing levels of failure. The entire story is in this final graph. SBI! excels at success, Wealthy Affiliate. at failure. The results are reproducible. And it doesn't matter if 1,000,000 affiliates are willing to sell their soul to drag you down. Ignore claims of income. Anyone can (and many do) lie. Ignore streams of meaningless activity — drone-like comments of little value do not drive results. Ignore scans of bank accounts or payment checks. Ignore screenshots of Google Analytics. All of those can be faked. Ignore wonderful life-changing quotes from unverified "customers" with no domain nae — they're easy to make up. Insist on seeing the only thing that can't be faked — the domain name of the success story. That enables you to verify that they are customers of Wealthy Affiliate. or Solo Build It! (using whois) and you can check traffic with Alexa, SimilarWeb and SEMrush. We promise you the best track record online. No gimmicky "free trial" that cripples the product, offers you 2 "free sites" (that are just subdomains and will never get any traffic), and no endless upselling. You have total access to all of SBI! — immediately. You can't lose even if you decide SBI! is not for you. The most common reasons boil down to "too much work." If you learn that, rest assured that there's nothing easier that also works. So you can rest happy knwing that you have other priorities that you do not want to sacrifice now for the goals and dreams that matter to you later. Most, though, fully "get it" when they dig into SBI!. You, too, will be off to the races, building yourself a business that impacts your life. Alexa's traffic estimates are based on data from our global traffic panel, which is a sample of millions of Internet users using one of many different browser extensions. In addition, we gather much of our traffic data from direct sources in the form of sites that have chosen to install the Alexa script on their site and certify their metrics. Alexa global traffic rank is a measure of how a website is doing relative to all other sites on the web over the past 3 months. The rank is calculated using a proprietary methodology that combines a site's estimated average of daily unique visitors and its estimated number of pageviews over the past 3 months. We provide a similar country-specific ranking, which is a measurement of how a website ranks in a particular country relative to other sites over the past month. A panel of monitored devices, currently the largest in the industry. Local internet service providers (ISPs) located in many different countries. Hundreds of thousands of direct measurement sources from websites and apps that are connected to us directly. SEMrush data is based on the first 100 Google search results found for each keyword in our database. It delivers a good idea of a site's traffic from searches. Much more is on the line. You can easily lose more than the cost of Wealthy Affiliate ($50/month). You may lose years of your life, finally giving up in despair, feeling like a failure. Report each fake affiliate review you find, including its URL. The issue of fake reviews and misleading online adds are on the regulatory bodies' priority list. Wealthy Affiliate will say, "we don't control what affiliates write." And affiliates will say, "it's just my opinion that Wealthy Affiliate is best." "You do your visitors a service because Wealthy Affiliate is the best." Actually, you are about to see the results of a study that shows it is not the best, not even close. You can even do the study for yourself. Report this effort to trick you into an inferior product, potentially ruining what could have been a better life, and let's move on to the good stuff!